Welcome to St. Jane de Chantal! 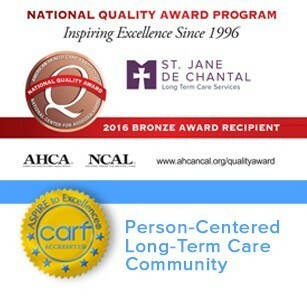 St. Jane de Chantal Long Term Care Services was named after the Catholic Saint Jane de Chantal, who believed every person, regardless of health or age, was special. Today, inspired by her beliefs, we provide a loving, person-centered environment for our residents to call home. We embrace a holistic approach to care that emphasizes the mind, body and spirit connection. Each of you show how invested you are in doing what is best for your patients and their families. The family of Maddie B.
I immediately felt the compassion in your hearts. You and your staff were our angels on Earth. It takes a special person to care for the elderly. You have our eternal gratitude for the kindness and respect you showered upon our mother. Serves people with orthopedic and/or medically complex diagnoses, following acute care hospitalization to transition home. Has offered specialized care since 1985 for patients with complex medical needs, including ventilator-dependency.